Do you know how ninjas are trained? Here you have a nice opportunity to join a ninja training. 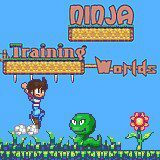 Help this young hero to go through a long obstacle course full of deadly traps and dangerous creatures such as venomous snakes and giant crabs. Good luck!